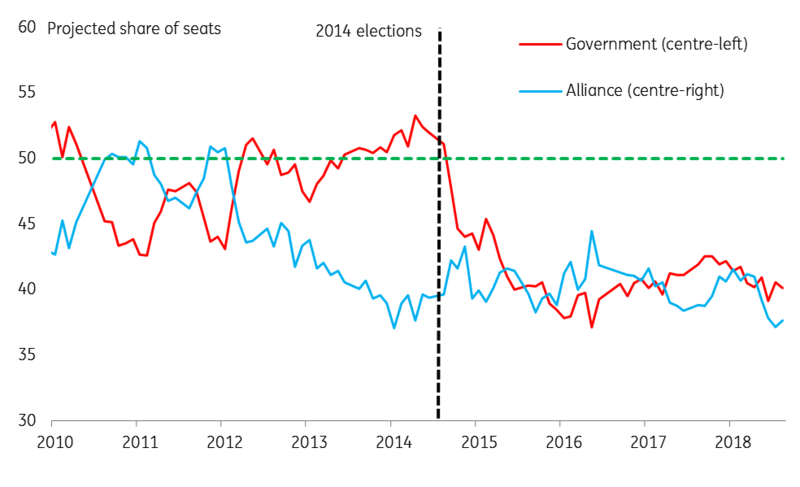 Swedish elections are usually fairly staid affairs and historically, have not been all that interesting from a market perspective. When it comes to economic policy, the differences between the mainstream centre-left and centre-right political blocks in Sweden are arguably not all that significant. The centre-left tends to favour welfare spending when in power while the centre-right is more likely to pursue tax-cuts, but both are committed to a sound budget underpinned by a fiscal rule. While EUR/SEK has also been showing a degree of risk premium, it is not extreme (i.e. the misvaluation is still within the 1.5 standard deviation band) and well below the February to May 2018 highs. The lack of an extreme risk premia present in the SEK spot suggests that the krona may experience more weakness in response to the likely hung parliament result and the accompanying uncertainty. We retain our bearish SEK view and target the EUR/SEK 11.00 level by the year-end. 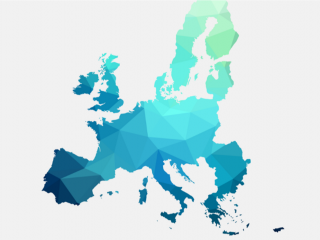 The likely political uncertainty following the hung parliament result, the dovish Riksbank, slowing economy, the deteriorating Swedish current account and cheap funding costs should all keep SEK under pressure for the remainder of the year. Needless to say, with Sweden being a small open economy, the spectre of trade wars is a clear negative for SEK. Although short-term SEK negative, we don’t expect the outcome of the Swedish election to be a structural and persistent negative for SEK (as per above). Rather, its negative effect on SEK should be a matter of months (during the initial phase of uncertainty) rather than quarters. Coupled with cheap medium-term undervaluation, we expect the SEK weakness to trough this year (around EUR/SEK 11.00) and to embark on a very gentle recovery trend next year. In the relative value space, we continue to favour long NOK/SEK positions as (a) elections will weigh on SEK and (b) Norges Bank rate hike in September will support NOK. NOK/SEK to break above the 1.10 level next month. 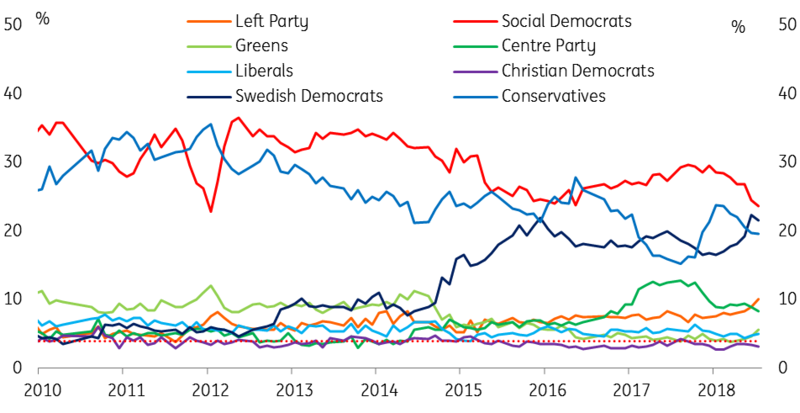 Swedish politics: Will it all be over by Christmas? Swedish 1Q GDP: The last hurrah?